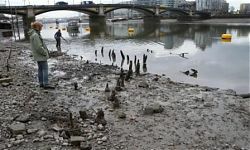 The work of many different archaeological groups, both avocational and professional, has revealed a number of fish traps on the Thames foreshore in central and west London. These groups include the Thames Archaeological Survey, the Richmond Archaeological Society, the Wandsworth Historical Society, the Thames Discovery Programme and Museum of London Archaeology. 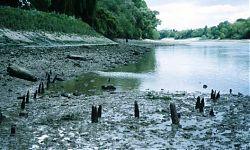 Four fish traps have now been dated to the early Saxon period (at Barn Elms, Putney, Hammersmith and Nine Elms, Vauxhall) and four to the mid Saxon period (a second trap at Barn Elms, one at Isleworth and two at Chelsea). All of these structures are only revealed at very low tides. The two best preserved examples are at Chelsea (Fish trap 1 – dated to AD 730-900) and Isleworth (dated to AD 650-890). The plan forms and make up of both of these traps are very similar; both are V-shaped with a long “neck” in which the trapped fish are held. The traps are made of piles of 6-13cm in diameter and are mainly timbers in the round (with bark still surviving on them in some cases), with six-sided faceted points where they have been driven into the ground. Originally, the sides of the fish traps were probably constructed of wattled hurdles, and the smaller posts, which survive at Chelsea, may represent a back brace for the hurdles. The regularity of the material used for the traps suggests the presence of managed woodlands in the local environment. The positions of the fish traps at Chelsea and Isleworth also give us further evidence of Saxon exploitation of the local resources. The trap at Isleworth faces downstream, while that at Chelsea is facing upstream, thus the two traps were designed to catch different types of fish. For example, salmon swimming upstream could have been trapped at Isleworth and eels coming downstream caught at Chelsea. There is lots more interesting research to be done on these structures: of particular importance is an examination of whether they functioned with tidal or fluvial water flow – which may have interesting implications for a discussion of the location of the tidal head of the Thames during the Anglo-Saxon period.